Stripling Irrigation Research Park, an affiliate of the University of Georgia, is a state of the art irrigation research center and it is located in Mitchell County. A State of the art irrigation research and education center used to assist farmers and the general public in understanding the role of water, and it affiliated with the UGA College of Agriculture and Environmental Sciences. This 16 acre park has a breathtaking view of the Flint River with campsites along the river. This is a great area for fishing, bird watching, or relaxing picnic. Professional fishing guides are available as well. It is located on Old Georgia Hwy 3. The Flint River Outpost located in the Flint River Park provides canoes, and kayaks for rent. The Outpost has several trips to offer, however, the most popular trip is from the Radium Springs landing to the Flint River Outpost which is approximately 8 miles. All trips are furnished with a shuttle service, life jackets, flotation cushion, and paddles. 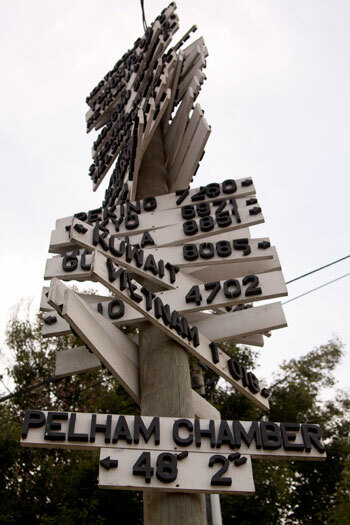 For nearly five decades, the directional sign in Pelham has been giving passers-by directions to such historical places like Athens (Greece), Cairo (Egypt), Istanbul, and more. The only American city listed is Plains, Georgia. This sign stands as a quirky landmark that decades of picture takers and visitors enjoy.